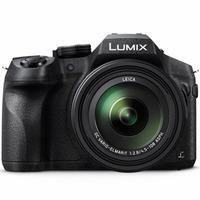 The Panasonic Lumix FZ330 bridge camera boasts a 24x optical zoom (35mm equivalent: 25-600mm) with fast f/2.8 aperture, splash- and dust-proof construction and 4K photo/video recording. The 12.1-megapixel high-sensitivity MOS sensor, versatile f2.8 aperture and ISO sensitivity up to ISO 6400 reduces noise in dimly lit environments and delivers crisp, blur-free shots throughout the entire zoom range. The DMC-FZ330 is capable of recording smooth, high-resolution QFHD 4K video in 3840x2160 at 30p(60Hz) / 25p(50Hz) or 24p in MP4. Taking advantage of 4K video recording performance, users can capture the fleeting photo opportunities at 30 fps in 8-megapixel equivalent resolution.